"Japanese Cruisers of the Pacific War"
Eric Lacroix and Linton Wells II's Japanese Cruisers of the Pacific War is one of those truly memorable references which appear from time to time that becomes a lasting part of naval literature. Comparable reference works include Jentshura's Warships of the Imperial Japanese Navy, or Norman Friedmann's outstanding works on the U.S. Navy. With its comprehensive discussion of Japanese cruiser design and development, coupled with a complete operational history of each vessel, Japanese Cruisers goes far toward filling major gaps not only in the design but in the battle history of the Imperial Japanese Navy. One of the book's strengths is in how it chronicles the relationship between the development of the various cruiser designs and the ongoing ever-shifting political agendas and turmoil of the pre-war years. How these considerations influenced such diverse factors as machinery and hull strength to tonnage is set forth and extensively footnoted. The net result is a clearer understanding not only of the intended role of the cruisers, but of the surface ships of the fleet in general. In some cases the actual deployment and achievements of the vessels is seen to be other than for what they were designed; proving successful in some cases, less so in others. Of course the core of the book lies in its painstaking, meticulous analysis and dissection of the design of each cruiser class, complete with more than 200 plans, profiles, and cutaway views ranging from superstructure towers to boiler and bulkhead arrangements. Readers familiar and pleased with the Anatomy of a Ship series volume on the TAKAO will be rewarded by a plethora of similar detail and examination of ordnance, hull, and other minutiae for all the Imperial Navy's cruisers. Equally significant, these plans and diagrams follow the full range of the ships career, with wartime modifications fully discussed. Notable among these is the inclusion of several diagrams of damage sustained in action. The illustrations and photographs have been chosen with care, and many of them have never been published outside of Japan or indeed - in some cases - at all. The captions are carefully researched, and where necessary, the authors have corrected previous erroneous labeling or dating of published prints. Particularly noteworthy is the discovery and first-time publication of some archive prints from U.S. attack reports, the most striking example being the photographs of the YASOSHIMA (ex-PING HAI) sinking, of which little record survives otherwise. The Operational histories, though secondary to the design focus of the book, is nonetheless one of its important assets, and makes it an essential part of even the non-specialist's library. 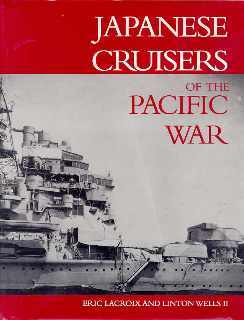 Organization and Orders of Battle of Japanese Cruiser divisions are described and followed in chronological order per ship, relying extensively on never translated Japanese microfilm records, the official histories, and innumerable modern works in Japan such as the Ships of the World and Maru Special series. In many cases the authors have translated much of the text of the relevant BKS and Maru Special volumes, and in so doing provide in English for the first time much of their content. In all cases the translation is professional and sound, and having had the opportunity to check some of these against the original records, the referencing and transcription is demonstrably complete, and in most cases, entirely accurate. Each capsule history follows the vessel from its commissioning to its ultimate fate, and gives the names of commanding officers and dates of assuming command. However, this applies only to the heavy cruisers; the light cruiser commanders are not named. This is a curious omission, considering one of the sources used - the Maru Specials - contain this information as they do for the heavy cruisers; but it detracts not at all from the work. Finally, the authors provide in the closing of the book a singularly valuable and detailed set of appendixes. These describe among other things the Organization of the Imperial Navy, its specialized terms and designations of ordnance, an overview of the heads of the shipbuilding department from 1920 to war's end, discussion of machinery and aeronautical equipment, maps and time charts, and a host of other tables and studies. All of these providing a comprehensive and readable introduction to the larger context of the Imperial Navy and its form and making for a-must-read for those seeking a broad and clear understanding of the IJN and its terminology as its officers and men understood it. In fact, it is the book's dedication to using the actual Japanese terms and even vowel structure that make it an essential cultural bridge as well. The Glossary has the novelty and merit of spelling out and defining a host of Japanese language naval terms that proves of immense value to the historian attempting the difficult task of determining the meaning of Japanese combat reports and microfilmed records. A complete listing of these kind of sources is also to be found in the detailed bibliography. All of these sections make Japanese Cruisers of the Pacific War an indispensable addition to the library of not only any interested in the Imperial Navy and the Pacific War, but also to those interested in target identification and the development of a nation's naval development and design in general. The authors are to be heartily congratulated for the years of research, and the United States Naval Institute Press for publishing it.